Amenities abound at this top-of-the-line property. Rooms of all shapes and sizes are available and feature decor that is both cozy and chic. With several fine dining experiences as well as a food court, you're guaranteed to find something for everyone. If you're planning a corporate event, Red Rock is ready to help with over 70,000 square feet of meeting and conference facilities. Nightly entertainment can be found in one of its many bars and night-clubs, and the gambling facilities are top notch. Or, if you'd rather take it easy, Red Rock is home to a 35,000 square foot spa that exudes relaxation. One of the largest draws and attractions at Red Rock is the three acre backyard, complete with a beach area, cabanas, wading pools, swim up gaming, and an exotic island. The pool area also serves as an entertainment area that can host a variety of public and private events. Take advantage of the concierge services at the resort for assistance in setting up your show reservations, adventure tours, restaurant reservations, floral and gift basket requests, shuttle service and much more. 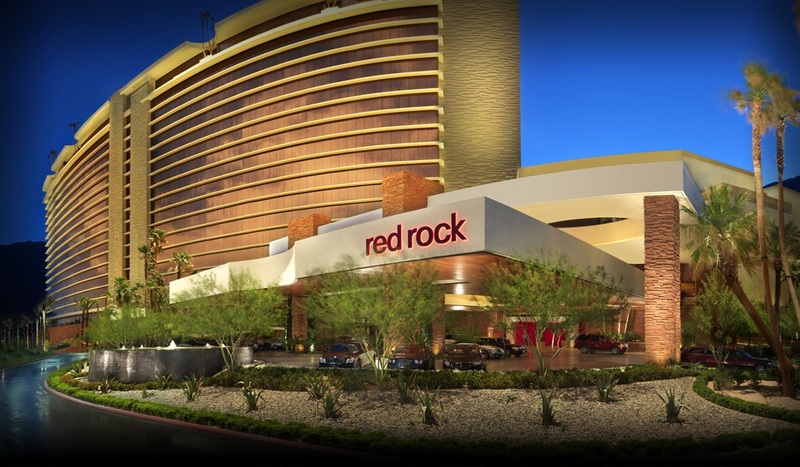 Have a Las Vegas experience like none other at Red Rock Resort. Call us and book today! The contemporary architecture of the Aria tower is complemented by the resort's lavish accommodations. The Bellagio offers deluxe guest rooms and suites featuring sweeping vistas of the lake, surrounding mountains and Las Vegas skyline. Caesars Palace noted as the "Legendary Gaming Empire" of Las Vegas - offers 129,000 square feet of casino space, separated into three astounding Casino Areas that leave you breathless. The newest addition to the Las Vegas Strip, the Cosmpolitan of Las Vegas exudes luxury and class with a fresh perspective - overlooking the heart of the strip. Meet in style, both inside and outdoors, at Delano Las Vegas. Located on the corner of Las Vegas Blvd and Tropicana, the Excalibur resort is one of the many properties on the Las Vegas Strip that is designed around a central theme. Originally built in 1946, this property is one of the oldest casinos in Las Vegas. For the past 29 years this resort has been awarded the Four Diamond rating from AAA. Staying at the Luxor Hotel in Las Vegas is like getting of ancient Egypt! The Luxor is the only sphinx-guarded pyramid on the Las Vegas Strip and the second largest pyramid in the world. Mandalay Bay Hotel and Casino sits at the south end of the strip. Entering the MGM Grand Hotel and Casino in Las Vegas, visitors have access to more than 14 restaurants, 5,009-rooms, great entertainment, a nightclub, a Lion Habitat and many more attractions. Set amidst lush foliage, towering waterfalls and sparkling lagoons, The Mirage Hotel and Casino is a South Seas oasis, offering the serenity of the tropics and the excitement of Las Vegas. New York-New York Hotel Las Vegas, one of Las Vegas' most charming hotel and casinos and also one of its best. Located on the Las Vegas Strip, next to its sister property, The Venetian Las Vegas, the $1.9 billion, 50-story Palazzo Las Vegas literally takes luxury to new heights. Park MGM Las Vegas formerly The Monte Carlo Las Vegas is a solid fusion of European refinement, American dazzle and true Las Vegas hospitality. Be seen at the hottest new Resort and Casino in Las Vegas, at the best location on the strip! The Planet Hollywood Resort and Casino in Las Vegas is the place where everyone is a celebrity. The spirit of Venice is alive in The Venetian Resort in Las Vegas, complete with canals, gondolas and strolling performers. The Wynn is the latest feather in the cap of casino magnet Steve Wynn. Steve Wynn has always had a flare for opening the most anticipated hotels on the Las Vegas Strip.